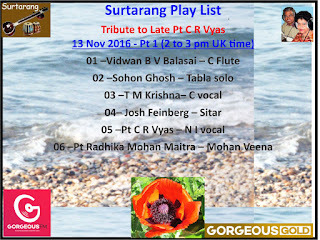 Re: SURTARANG PAYS BIRTHDAY TRIBUTE TO LATE PADMA BHUSHAN PT C.R. 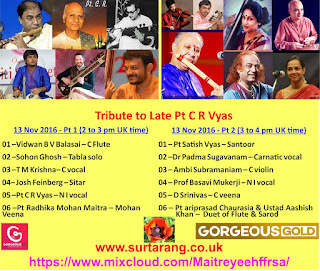 VYAS - 92ND BIRTH ANNIVERSARY - 9.11. 1924 - 10.1.2002. 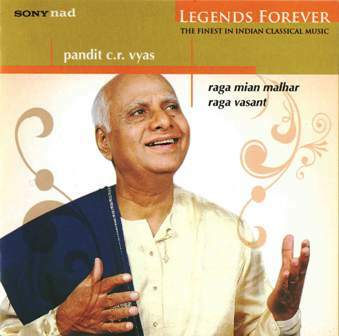 Chintaman Raghunath Vyas (Marathi: चिंतामण रघुनाथ व्यास; 9 November 1924 – 10 January 2002), popularly known as C. R. Vyas, was an Indian classical singer. He was renowned for singing khayal style. Born into a family of keertankars and Sanskrit scholars, C.R. Vyas was born in an obscure village of Thair, near Osmanabad in Maharashtra. He was born in a village that did not have any facilities for formal education. However, that did not stop his determined mother, who wanted her sons to have good education. As such, she went on a hunger strike for days just to convince her husband to provide good education for all the three sons. Eventually, his father gave in and the kids were admitted to a school in the town under the guidance of Vyas' maternal uncle. Though Vyas' uncle was a farmer, he was an excellent sitarist. 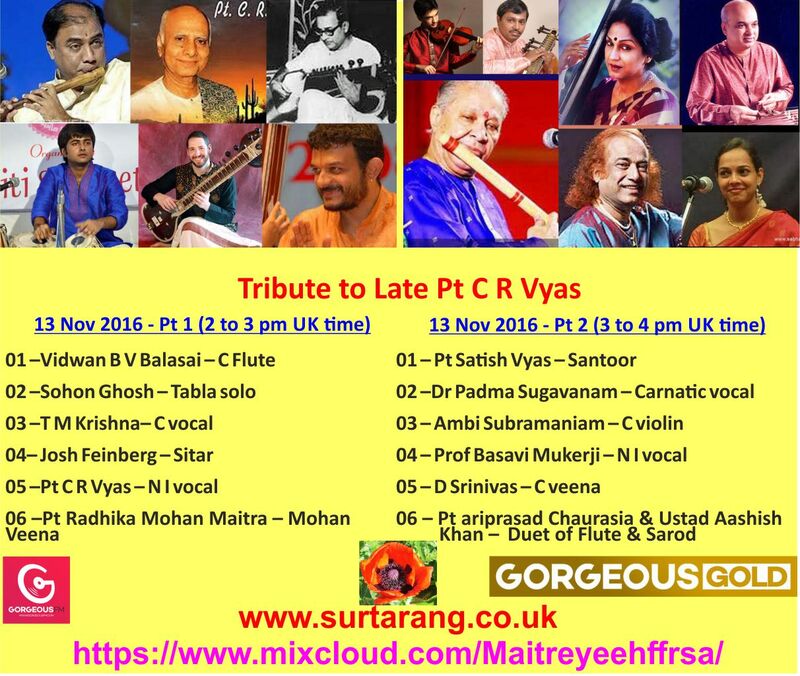 This helped Vyas to a great extent in his music interest, when his uncle admitted him under the tutelage of his friend Pt. Govindrao Bhatambrekar of Kirana gharana where he learnt music for over a decade. It was the demands and willpower of his guru that Vyas managed to build up his classical base. However, Vyas neither comes from any old gharana (traditional lineage of khayal singers) nor limits himself to narrowly following any one particular gayaki. "I wanted to learn music not gharanebazi (gharana politics)," he asserts. For a person whose first love, first commitment and first passion is music, he is bound to make it big in the industry with a long list of disciples following him. In the music industry, it is C.R. Vyas who is regarded as one of India's leading vocalists. With immense contribution to the world of Hindustani classical music, C.R. Vyas was successful in making it big into his dreams and goals, thereby carving a niche in his related field. Since childhood, he was ambitious and high-powered on learning music and ended up creating his own distinct style with a perfect blend of melodies from various gharanas. He is best remembered for singing the khayal style, a modern genre of classical singing in North India, much similar to the qawwal singing style. Apart from being a successful vocalist, Vyas ji was also known as a bandishkar. He wrote about 300 compositions set to various ragas and a book titled raag sarita. 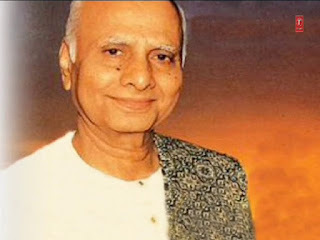 Recipient of several awards like the Sangeet Natak Academy and Padma Bhushan, Vyasji's music had shades of the Gwalior, Agra and Kirana gharanas. "In our time we did not think of earning either fame or money through music," says the ageing yet ebullient and sprightly Vyas, who held a white collar job in ITC for 34 years." C.R. Vyas composed several ragas and bandishes under the pen name of "Gunijan". Dhankoni Kalyan, Sanjogiya, Shiv-Abhogi, Sagera and Shuddha Ranjini are some of his celebrated ragas popularly performed in concerts. He gave over 200 bandishes in different ragas. To honour his Guru Gunidas, Vyas began the Gunidas Sangeet Sammelan in 1977 which is still celebrated in Mumbai and in various parts of India. He even penned a book titled "Raag Sarita" which includes a detail about his contributions to the field of music. He was honoured with several prestigious awards throughout his music career. Legacy C.R. Vyas' disciples include a long list of young talented artists of today. The most prominent ones are Pt. Jitendra Abhisheki, Prabhakar Karekar, Ganapathi Bhat, Suhas Vyas (his son), Kunda Weling, Sanjeev Chimmalgi and Alka Joglekar. 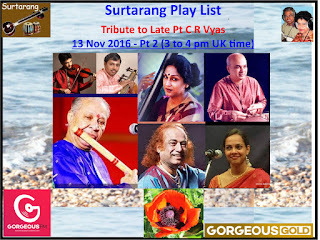 Musicians, like Veena Sahasrabuddhe, Lalit Rao, Shubha Mudgal and the sarod player, Biswajit Roy Chowdhury, who have picked up musical ideas from his compositions. Sangeet Natak Akademi Award, 1987. 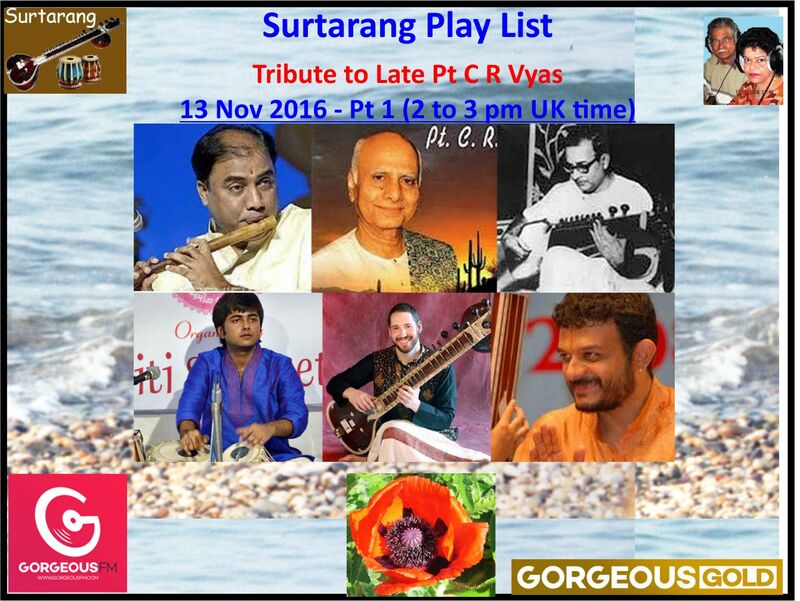 SURTARANG WILL FEATURE MANY LEGENDs & MAESTROs SUCH AS LATE PADMA BHUSHAN PT C.R. VYAS, PADMA VIBHUSHAN PT HARIPRASAD CHAURASIA, PT RADHIKA MOHAN MOITRA, USTAD AASHISH KHAN, PROFESSOR BASAVI MUKERJI, PT SATISH VYAS, DR PADMA SUGAVANAM, AMBI SUBRAMANIAM, JOSH FEINBERG, B.V. BALASAI, T.M. KRISHNA, D SRINIVAS & SOHON GHOSH. 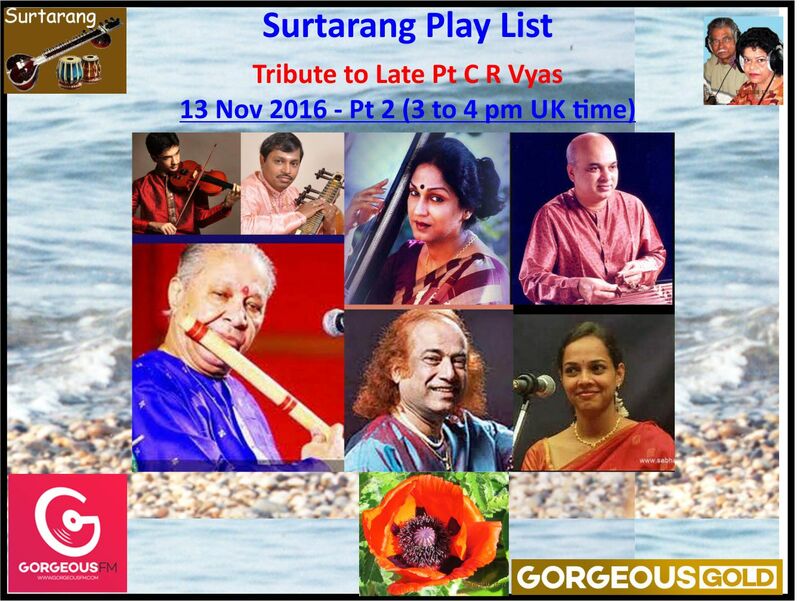 WE WILL BE INTRODUCING 3 MUSICIANS: LATE PADMA BHUSHAN PT C R VYAS, D SRINIVAS & SOHON GHOSH. 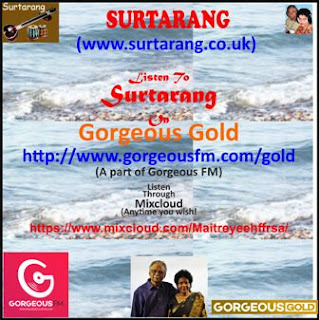 SURTARANG WILL BE PRESENTED BY MR SISTACHAR SARCAR & MRSMAITREYEE SARCAR OF WOLVERHAMPTON, UK. It is also available online & on Mobiles. 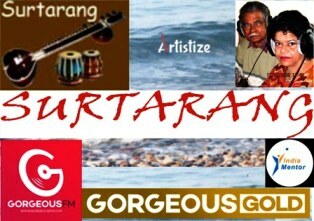 Surtarang is a unique and a pioneering broadcast in the United Kingdom as it only promotes pure Indian classical & semi classical music at its finest. KINDLY SPREAD THE NEWS OF SURTARANG BROADCAST GLOBALLY & HELP US WITH PUBLICITY. Please see our latest announcement attached.